Noshly for People - Noshly - Wise eating, made easy. We’re building a website and mobile app to help you find the food you want and help the world supporting food that’s healthy! The foodies at Noshly have spent a lot of time chopping vegetables, twisting bottle caps, and peeling back lids to bring you a range of cashback offers you can claim for your shopping. 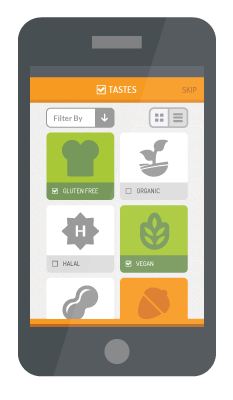 Register for the pilot app, set up your eating preferences and you’re ready to start receiving recommendations of locally available healthy and ethical food and drinks. All you have to do is make a purchase, scan your receipt and the cashback offers will be donated to a nominated charity. Not only can you get cashback on some great produce, but for every receipt you upload you get a chance to win your weekly grocery shopping on Noshly! Plus there’s more ways to win! Have a favourite product? Upload a picture, along with a few details about it and get 2 more chances for every new product you upload! We’re building a website and mobile app to help you find the food you want and save you money on stuff that’s healthy! All you have to do is make a purchase, scan your receipt and the cashback offers will be deposited into your account.